Traditionally, the business model of a local mom-and-pop kirana store has been simple. The store owner procures and stocks up the grocery in high volumes. Later, the orders are fulfilled at the store as per the needs of customers. The orders received are mostly from local customers residing in the range of 200 to 500 meters. The bulkier orders are assigned to an errand boy for delivery, which is done usually done on the same day. This is the traditional business model followed by a majority of local mom-and-pop stores in India. Of late, there’s a shift in consumer buying behavior with the advent of online grocery shopping. Due to the rise in women working population, the time spend for shopping grocery has reduced and therefore, consumers are open to shopping grocery online. As a local store owner, you need to adopt a multi-channel selling strategy to keep up with the changing buying behavior of your consumers and to make sure that your store does not run out of business. So, if you’re a local grocery store owner, it’s time to scale up your business and sell grocery online in your local area. Here’s the step by step guide on how to sell grocery online in your local area without spending a ton of money. The very thought of taking your kirana store online may overwhelm you. However, it gets simpler as you understand how it’s done. A lot of variables come into the picture when you’re to set the area coverage for delivery. Take into account the population of the area, labor, delivery time, and weight of the order. Dense population means you might want to keep your coverage area small. Less resources again mean less area coverage. 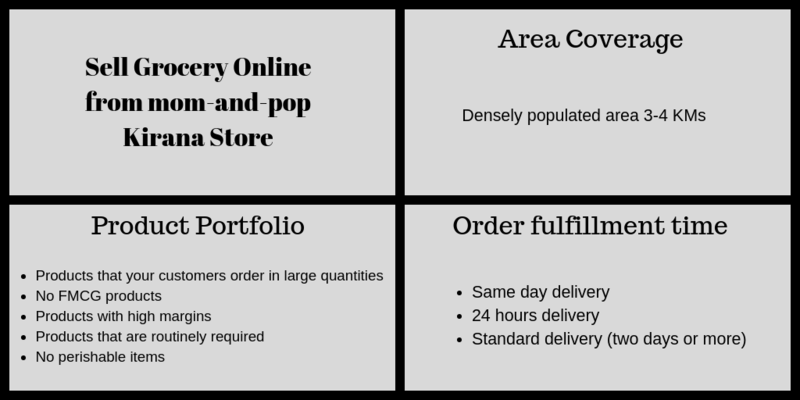 However, unlike in the traditional business model, you can set scale up delivery coverage to 3 to 4 KMs even if the area is densely populated. But initially, it’s better to start small and bear in mind it as a trial and error experiment. Understanding the sweet spot of getting to a decent addressable population may take some time. Since you’re starting from scratch, you have the upper hand while choosing what grocery products to sell online. You may have hundreds of products in your store. But, choosing only a handful will seal the deal for you. Don’t choose FMCG products available in a pharmacy. In short, selecting branded products is a big no-no. After applying these filters your portfolio should come down to a handful number of rock-solid items. Since grocery is an immediate need of consumers the order fulfilment time becomes important. Delayed delivery may be a put-off. Therefore, it’s better to set a small area coverage initially. Over time when you start receiving orders daily, the process will smoothen up and you’ll be accurate with your fulfilment time. Going from offline to multi-channel selling can get uncomfortable especially if you’re not well versed with the internet and technology. However, that doesn’t change the need of the hour for your business. Once the blueprint for products, area coverage and delivery time is ready, it’s time to set up your own eCommerce website to sell grocery online. It’s time to put the operations of your business on a pedestal. A good eCommerce website is the one that takes care of all your complex business functionalities and offers your customers a seamless buying experience. A good eCommerce website is all about executing all the features you wish to provide to your customers. So, keeping all the basic features aside (product upload, customization, banners, etc.) there are specific features your eCommerce website must have to sell grocery online. As you’re selling locally, you need not tie up with any shipping vendor. Essentially all your orders are to be fulfilled from your end. It’s important to display shipping options (one day delivery, same day delivery, and standard shipping) on your product page. You can offer them pickup option (convenient for customers who live closer to your store) so that they can collect their order whenever feasible and save delivery charges. This helps them save their time as against shopping offline. If you’re offering free shipping on all orders then there’s an end to the shipping story straight away. However, if not then charging for shipping may be complicated. To take care of the same, you can charge shipping based on the weight of the order. The bulkier the order, more are the shipping charges. COD payment option is the clear winner in India. Though customers may know you personally, they’d rather prefer COD. 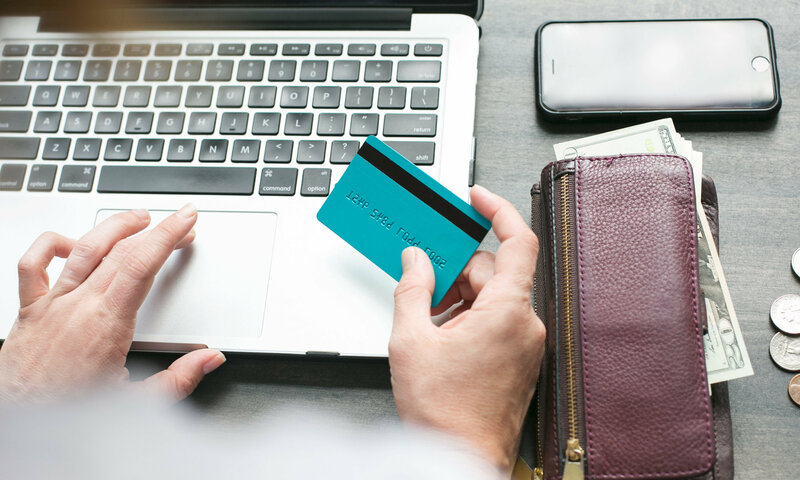 So, apart from bank transfers, and plastic card, keep the payment options open to your customers to improve the odds of a sale. Up until this point when your website is up and about, the work is still half done. Very likely you will expect to receive orders from day one. Here’s the thing. Once the website is ready the immediate challenge is to get it in front of your potential customers. The good news is that you know your target audience and you don’t have to spend a lot on marketing your store. This idea may sound outdated, but it’s still an effective and affordable way to target your potential consumers. When your store goes lives, start distributing flyers in your area. The flyers should communicate your product and shipping information. You can start with at least getting 1000-1500 flyers. This will drive people to come to your website and create awareness. You already have a ton of footfalls every day in your store. Inform them about your store going online and persuade them to buy online by offering 5% discount. Once you build a habit of shopping online your customers will have rather start shopping online. Parallel to offline marketing, you can start promoting your store online on Google. A lot of users search with key terms like “Online grocery shopping” or “grocery delivery”, “grocery shopping” etc. Google allows you to run ads geographically by setting your preferred location. You can set up the location for your ads. Consumers in your area looking for your grocery products will be displayed with your ads. At the beginning for a few months you may be required to run ads aggressively to create awareness. As you have a very limited target audience you can gradually slow it down when you feel that you’ve reached addressable population in your area. As you start getting orders on a daily basis and your operations settle down, you can expand your portfolio- dry fruits, gourmet etc. Another option to increase the scalability of your business is to expand your reach. If you’re selling in a 5KM radius, expand it to 7 or 10KM. All that depends on the resources you’ve and the time you’re willing to dedicate to your business.